A couple weeks ago, a group of ten nonprofit and government stakeholders from Romania learned about bear-resistant trash bins in the Swan Valley. They tested latches, pummeled the thick plastic with their fists, and ran their hands over jagged and warped edges left by grizzlies who chewed – but failed to open– the bins. U.S. Forest Service Swan Lake Ranger District Wildlife Biologist Mark Ruby tries to open a bear can as SVC Conservation Director Luke Lamar looks on. Facilitated by Humane Society International with financial support from the Trust for Mutual Understanding (TMU), the group arrived in the Swan Valley ready to learn more about how non-lethal bear solutions are working in Montana. TMU provides grants for cultural and environmental learning exchanges to promote improved communication, cultural understanding, and learning, so we were thrilled they selected Swan Valley Bear Resources (SVBR) as an inspiring and effective model of collaborative conservation. SVBR brings government agencies, nonprofit stakeholders, and local citizens together to improve human-wildlife coexistence. Landscapes, like language, do not always translate directly – but our Romanian visitors could easily see how a community-driven approach is central to success whether it’s here or on the other side of the world. SVBR’s model of educational events, technical services, and cost-share assistance showed them that empowerment can be more effective than enforcement, resulting in better outcomes for humans and bears. One of the mantras of bear coexistence in the American West – that “a fed bear is a dead bear” – particularly hit home for the Romanians. The grizzly in Montana and the Eurasian brown bear in Romania are both subspecies of Ursus arctos, but Romanians' current attitudes toward bears recalls the United States' management approach four decades ago, when national park employees at Yellowstone and Glacier fed bears at dumps to entertain crowds of tourists. Our participants described the situation in their country as strained, even chaotic. Bear feedings for the public are a widespread attraction, and even where they’re not, conflict prevention techniques like pepper spray, bear-resistant trash bins, and electric fencing are rarely employed. Bear feeding was also once a common lure for sportsmen, until brown bear hunting was banned in 2016. Habituated, free from the pressure of hunting, and unafraid of humans, these bears are causing damage for urban and rural citizens and putting themselves at risk once again. Romanians are proud of their bears. Whereas many European nations exterminated their once-common bears centuries ago, Romania’s have endured, comprising 60 % of the continent’s population. Romanian bears increasingly find refuge from climate change in the high elevation of the Carpathian Mountains, but the nation's identity is closely tied to the powerful and respected bruin. Romanians dress and dance as bears in a traditional new year’s celebration to invoke their good fortune, and shepherds using guard dogs to move their livestock in historic, seasonal migrations to alpine pastures (a practice called transhumance) prove that it's possible to live with the predators. Romania has roughly 150% more land, six times as many bears, and a population of over 19 million people, compared to just over one million in Montana. Accurate population estimates have been complicated by the bears' uneven distribution and widely divergent claims among stakeholders, but it’s generally assumed there are 6,000-7,000 bears in the country. By comparison, there are an estimated 1,000 bears in the Northern Continental Divide Ecosystem, which is roughly six times smaller than Romania. After an overview presentation by Swan Valley Connections’ Conservation Director Luke Lamar and U.S. Forest Service Swan Lake Ranger District Wildlife Biologist Mark Ruby, we spent the day sharing tactics that work here in the Swan Valley. At SVC’s office, we demonstrated a variety of bear-resistant garbage containers, showing how this modest but effective technology has evolved over time. While we could have easily sent bin specifications via email, seeing them in context helped participants envision how they might employ and adapt them back home. There are so many little details to consider, and we talked through nuances like the way modern garbage trucks are built to pick up and dump the bin mechanically, or the fact that people are less likely to use their bin if it turns out to human-proof, too. Above, Luke highlights a bear-resistant dumpster that's useful for small businesses or sharing among individuals, and below Mark shows off another style in use at Holland Lake campground. One of the goals of Swan Valley Bear Resources is to meet people where they are, with tools that are adapted to their needs and easy to use. We also visited Holland Lake campground to see cutting-edge bear-resistant bins and food storage lockers, the same technologies that helped reverse the hazards of feeding stations (intentional or otherwise) at our national parks and forests. Seeing how BearSaver containers have revolutionized outdoor recreation in the U.S. over the last few decades, saving untold numbers of bears and preventing harm to property through such a simple concept, deeply impressed our new friends. 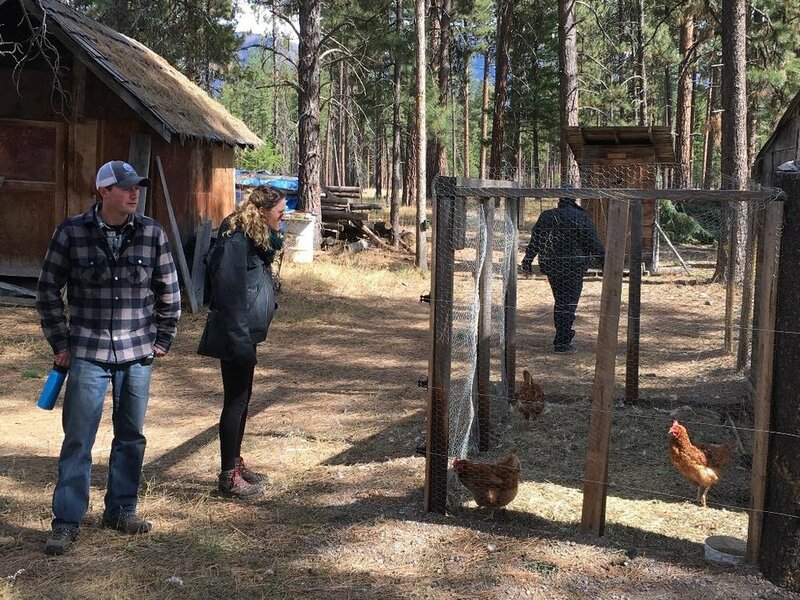 We ended the day visiting a local private property where, just days before, a grizzly got bold with some chickens, killing four. The landowner called Luke the next morning and within the day, SVBR had an electric fence built and pulsing with power. Though the bear’s tracks remain in the dust, all has been safe since – which means the lives of the remaining chickens and bear will be spared, along with the heartbreak and hassle associated with catching and removing a problem bear. Chickens – and their feed – are an easy target for bears, but they’re also easy to protect with electric fencing. It was exciting to exchange ideas with partners from across the world who are devoted to minimizing impacts on wildlife. No solution is perfect, but coexistence is possible and necessary to achieve our goals for bear and human coexistence. Hearing Romanians say the word for bear – urs – was a moving reminder that bears unite us. The word shares a root with the Latin term, but in when it rolls off the native tongue, it also sounds a little like us.